When the first shot of the American Civil War was fired at Fort Sumter off the coast of South Carolina on April 12, 1861, nearly six thousand miles away, the Kingdom of Hawaiʻi was a sovereign nation. Although neutrality was declared, Hawaiʻi’s close relationship economically, diplomatically and socially with the United States ensured that the wake of the American Civil War reached the Hawaiian Islands. Slavery was prohibited by Hawaiʻi’s Constitution of 1852; however, there was considerable debate comparing it to the contact labor system that brought workers from Asia to fill the growing need for labor on the sugar plantations. This was a kind of indentured servitude, some in Hawaiʻi argued, that was little better than American slavery, a position that tended to fuel opposition to the American slaveholding South. In part, because of this boom in business, the majority of Americans living and working on the islands were devoutly pro-Unionist. In fact, many living in Hawaiʻi had an ardent desire to serve in the armed forces. Hawaiʻi’s neutrality did not prevent many of its citizens from enlisting in either Union or Confederate forces. One, a Hawaiian from Hilo, was Henry Hoʻolulu Pitman, son of Kinoʻole O Liliha, a Hawaiian high chiefess of Hilo. He enlisted in the Union Army and later died of disease in Richmond, Virginia’s infamous Libby Prison. About 40 individuals who were born and raised in Hawaiʻi served in the Civil War. As many as 200 immigrants to Hawaiʻi who were living here at the outbreak of the war in 1861 may have served in the conflict. 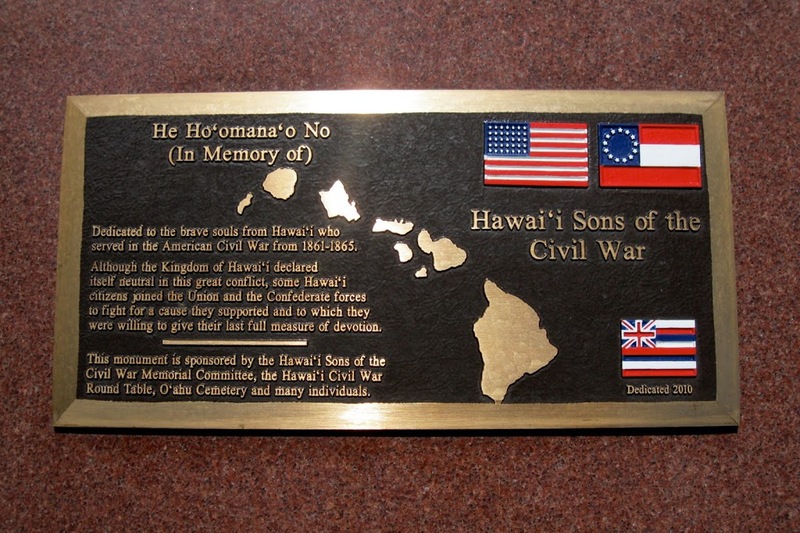 To honor these men, the Hawaiʻi Sons of the Civil War Memorial Committee installed a bronze and stone memorial at the National Memorial Cemetery of the Pacific at Punchbowl. It is dedicated to those from Hawai’i who served in the war. The war lasted from 1861 to 1865. Immediately following the war, many of the once prosperous sugar plantations collapsed as a result of the northern states reestablishing trade with their southern counterparts. In 1868, three years after the Civil War ended, a group of Union veterans established “Decoration Day” on May 30 as a time to remember and decorate the graves of service members with flowers, according to the Department of Veterans Affairs. By the end of the 19th century, Memorial Day ceremonies were being held on May 30 throughout the nation. (Lots of information here is from a Civil War summary prepared by the National Park Service.) The image shows the Civil War Memorial Plaque at Punchbowl. In addition, I have added other images in a folder of like name in the Photos section on my Facebook and Google+ pages.